Sankofa, Peace Corps’ Black/African-American employee affinity group, felt the need to compose a panel based on the conversations many members have had with other people of color and wanting to address how these events affect employees, directly and indirectly, on a regular basis, including the work environment. 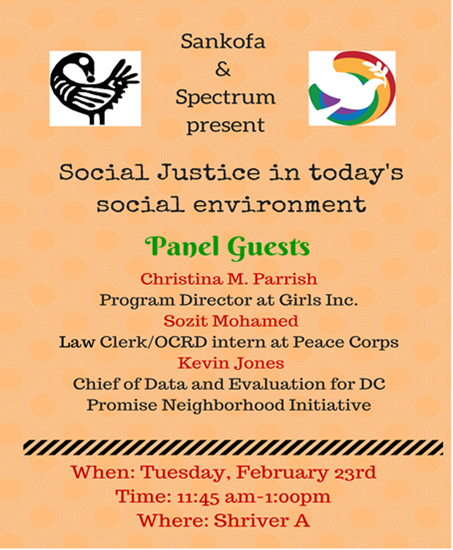 Spectrum, Peace Corp’s LGBTQ employee affinity group, added value by enlisting Kevin Jones who was an excellent part of the panel and helped create a stronger intersection of diversity and inclusion by speaking on his identity as a gay Black man, how his current job utilizes data to properly allocate and focus resources to DC neighborhoods in need, and his strong body of advocacy for LGBT rights and respect. Roughly 50 staff was in attendance. Recent events across the nation (the murder of Freddy Gray in Baltimore, events in Texas, Ohio, and elsewhere) have brought forth the issue of racial inequality through different lenses – law, education, entertainment, socioeconomics, among others. As the Peace Corps strives to create a diverse and inclusive environment for both staff and Volunteers that encourages an active and effective exchange of views, it’s important that Peace Corps employees have space to discuss and address these issues that are now in the national and international spotlight. Kevin Jones – For the past 20 years, he has worked with community groups and nonprofit organizations to use data to inform public health and educational strategies embedded in liberation and social justice. A highlight of his work includes traveling to Gaborone, Botswana to train professors and graduate students in using qualitative research methods for developing HIV prevention programs for young people. Prior to moving to Washington, DC in 2012, he established the Black LGBT Archivists Society of Philadelphia to collect, preserve and exhibit history. He currently serves as the Chief of Data and Evaluation for the DC Promise Neighborhood Initiative, overseeing performance measurement activities for its antipoverty strategies for students and families. Jones is originally from Detroit, Michigan. He completed his undergraduate studies at the University of Michigan, and received Masters’ degrees from the University of Massachusetts-Amherst and the University of Pennsylvania. Sozit Mohamed – Sozit Mohamed is a graduate of San Francisco State University (SFSU), where she received her B.S. in Political Science in 2009. The daughter of Ethiopian immigrants who instilled the value of education at an early age, Sozit became the first in her family to attend college. Through an academic scholarship and a part-time job, Sozit was able to finance her education all while maintaining the high G.P.A required of her academic scholarship. In addition to working and studying, Sozit became an active leader with various student groups at SFSU – including the Black Student Union and the Muslim Student Organization. Mohamed is currently an intern with Peace Corps’ Office of Civil Rights and Diversity and a Juris Doctorate candidate at the Howard University School of Law. She is a member of various student groups at Howard including the International Law Society and the Immigration Law Society, African Law Student Association and served as the Vice President of the Muslim Law Student Association during the 2014-2015 academic year. Christina M. Parrish – Christina Parrish joined Girls Inc DC as the Program Director. After graduating from Georgetown University in 2008 as a Culture and Politics major, with a focus on youth and education, Christina remained in the District and worked as an Education Director for the Boys & Girls Clubs of Greater Washington where her passion for youth development was enlivened. As the Education Director for the FBR Branch Boys & Girls Club in Southeast Washington D.C., she developed and implemented programming fit to the needs of area youth ages 5-18. At the Boys & Girls Clubs, her primary areas of programmatic focus included exposing participants to international cultures, college access and career exploration. After working for the Boys & Girls Clubs, Parrish went on to pursue an M.P.P. in Social Policy and International Development with a focus on Education Policy at the Maryland School of Public Policy. Parrish most recently worked for Georgetown University’s Office of Undergraduate Admissions where she was responsible for multicultural recruitment efforts and working on issues of college access for students from underserved communities, many of them first generation college-bound students. Christina is excited to continue to advocate for youth, specifically girls, with Girls Inc DC- an organization that creates a space for girls to be strong, smart & bold, so they become women who are healthy, educated and independent. What do you do (career path/employment and why do you do it)? How do the concepts of social justice and inequality vary across generations within a similar group? What risks and rewards are associated with adopting explicit social justice stances (ex: calling out oppression and discrimination when you encounter it)? If the struggle for social justice takes a toll on oneself, how do you manage to continue to advocate? And what can one learn from it? What have been some of your successes and challenges for you in your field? How do you incorporate social justice practices in your daily life (workplace, school, personal, etc. )?